Faced with the escalating cost of electricity and the continuing push to reduce greenhouse gas emissions, enterprises are looking to the latest technology for solutions. 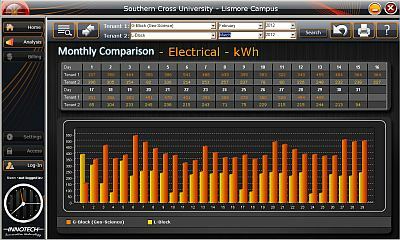 At Southern Cross University's (SCU) Lismore Campus in north east NSW, a lack of control and detailed data relating to the use of electricity and water was identified and solutions were sought. After a consultation process, Innotech Control Systems Australia was engaged to provide its Acquisition & Total Optimisation Management (ATOM) server based energy and water monitoring database to enable multiple stake holders in the university to better control the use of resources at the campus. 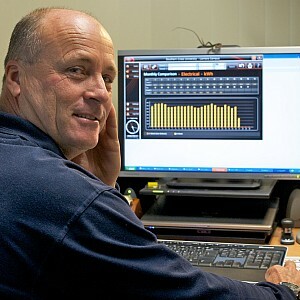 Innotech sales manager, Paul O'Connor, explains that SCU purchased Crompton Integra power meters and engaged local contractors to install them, while Innotech provided a web based graphical user interface to allow multiple concurrent users to view and analyse the data. "Users can see on a daily basis what energy and water each area of the university is using. This allows performance milestones to be set which automatically flag when the usage trend is likely to exceed targets," he said. "The system also allows users to compare historic day to day, week to week, month to month and year to year readings between areas being monitored. CO2 emissions are automatically calculated and reported." "ATOM is a complete analysis and reporting package which makes you aware of your building performance and environmental impact. "It can be integrated into any new or existing building, or multiple buildings that currently have no Innotech hardware or software." "A key feature is that it can be enabled as either a standalone solution or as a multiuser web based solution with support for up to five concurrent users via Innotech eServer." "Data is acquired through a Microsoft SQL Server database with either local or remote access. In addition to electricity and water consumption, this system can provide information on gas and thermal energy consumption, and hours run for HVAC equipment." "The SQL Server enables accessible business intelligence across an organisation by viewing data from various sources through dashboards and Sharepoint collaboration." O'Connor emphasises that ATOM provides a graphical user interface with real time monitoring of system data and coloured indication when forecasts exceed the set targets. "Inefficiencies in resource consumption can be identified to reduce costs and lessen environmental impact. This is a comprehensive data analysis system that incorporates forecasting capabilities, and provides password control with the ability to set multiple level user access," he added. According to O'Connor, Innotech ATOM software is capable of communicating with building services equipment with various protocols, including BACnet MSTP, BACnet/IP, OPC, Modbus RTU, and Modbus TCP. He also points out that ATOM can be utilised to generate reports and bill tenants for various building services between specific times and dates. This includes the generation of usage reports and activity statements for hours run utilising a tenant/services database that can be customised to suit specific applications. O'Connor says that following completion of the basic ATOM works at SCU, Innotech is working with local contractors to retrofit HVAC systems at a number of buildings in the first stages of a Building and Energy Management System (BEMS) installation. The main buildings involved so far include the old library at the Lismore Campus and the SCU Tweed Heads Riverside Campus. "These works have already delivered significant energy savings to the university. In addition, we have now developed a plan with the university to tie all of the campuses into the ATOM system, and BEMS is being provided to a new building which is under construction at the Gold Coast Campus. "This is a system that is easier for the SCU service personnel to use compared to the outdated systems that have been replaced. In the case of the library, the works also involved adding a free cooling cycle and CO2 control of the outside air volumes to reduce the amount of air introduced, based on the level of occupancy in the library. "HVAC systems at both sites are started using optimum start routines so that the plant only commences operating at the latest possible time before the buildings are occupied." 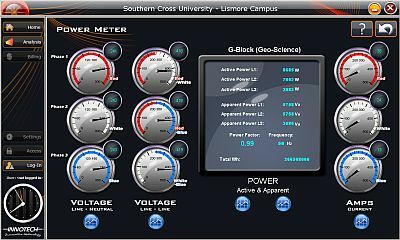 O'Connor believes that further benefits can be delivered by fitting all new SCU buildings with BEMS and continuing to expand the number of power meters at the Lismore Campus to be able to drill down further to where the energy is being used. SCU facilities supervisor, Jeff Braby, advises that so far 33 Integra 1630 power meters and 21 RMC Endurance Multijet Turbine water meters have been installed. "Each building has a primary power and water meter and in some buildings we have captured the HVAC power on secondary meters. In addition, BEMS controls have been installed on some of our large HVAC units," he said. "As time has progressed, the BEMS graphic displays of consumption, comparisons, and history has clearly indicated trends and provided valuable feedback to the end user. Energy savings have already been realised through the implementation of the HVAC controls and moving forward, more controls will be introduced. 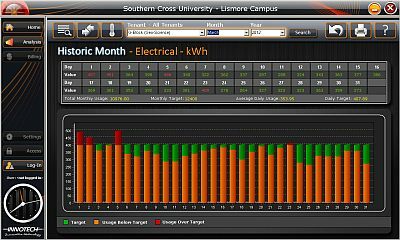 "The new Innotech BEMS controls became operational on 25 July 2011 and delivered a drop in electricity usage from 2609kWh on 24 July to 1560kWh on 25 July. "The difference in total energy usage between July and August is 23,810kWh. When multiplied by SCUs current electricity charges of approximately 18c per kWh, this represents a saving of $4285 for the month. This is a 16 percent return on investment and should have a payback period within six months, at the current electricity rate. "Our water meters are still to be verified, as some meters have not been in service for long due to the time it has taken to schedule water outages to install them. We have concentrated on power first as these were relatively easy to install. "However, it has been interesting to capture the water and power usage per building, instead of one lump sum reading, and BEMS readings also enable comparisons to be made with bills from the service providers."